The sport of Boxing certainly has more than it’s share of interesting stories. Whether it be a fighter working his way up through the ranks in hopes of eventually challenging for a world title, a former world champion on the comeback trail looking to regain past glory, or a fighter who is considered an underdog simply looking to prove themselves against established favorites. One story that can happen in Boxing is a fighter going through both highs and lows. For Jr. Middleweight contender Austin Trout he has experienced both highs and lows in the last two years of his career. After compiling a record of 25-0, with 14 Knockouts as well as earning interim/regular champion status in the WBA’s Jr. Middleweight ratings, Trout had his most significant win in the eyes of many when he defeated former multi-division world champion Miguel Cotto in December 2012 in Madison Square Garden. Cotto, who has a sizable following and has headlined The Garden on several occasions was favored to win the bout. On that evening however, it was Trout who earned a hard-fought and close twelve round unanimous decision over Cotto. In addition to defeating Cotto, Trout also broke Cotto’s New York undefeated streak becoming the only fighter to defeat him in Madison Square Garden. It was on the strength of that victory that Trout was able to secure a fight with Saul Alvarez in a fight that drew nearly forty thousand spectators in the Alamodome in San Antonio, Texas in April of last year. Much like his encounter with Miguel Cotto, the fight with Alvarez was highly competitive and both fighters had their share of moments. The bout with Alvarez would result in the first loss of Trout’s career losing a twelve round unanimous decision and also suffering the first knockdown of his career. Trout would go on to suffer another setback when he lost another twelve round unanimous decision to top contender Erislandy Lara in December of last year. Although Trout suffered two setbacks after arguably the biggest win of his career against Miguel Cotto, Trout is still after all a highly skilled, world-class fighter who lost to two of the best fighters in a talent stacked Jr. Middleweight division. There have been many fighters throughout Boxing history who have dealt with setbacks after their biggest wins and were able to rebound and regain their standing among the sport’s elite. The first step for Austin Trout came on August 22nd when he faced Jr. Middleweight contender and former world Kickboxing champion Daniel Dawson at the Pechanga Resort and Casino in Temecula, California. Trout, who entered this fight rated seventh in the world in the WBA’s Jr. Middleweight ratings faced a stern test from the fifteenth rated contender Dawson. Dawson, who came into the fight with an impressive record of 40-3-1, with 26 Knockouts , had once challenged for a Boxing world title and was undefeated for nearly four years with a draw in his first fight with Virgil Kalakoda in 2011. Although considered an underdog leading up to the fight, Dawson clearly was not an opponent that most would consider to be a mere “tune up” for Trout in his first fight since suffering those losses to Alvarez and Lara. Trout made good use of his hand speed early on as he consistently got his punches off first and kept Dawson somewhat on the defensive. Dawson however, almost brought the fight to a sudden conclusion in round three as he dropped Trout with a solid counter right hand. Dawson would score a second knockdown of Trout later in the round with another counter right hand. Trout would survive the round, but Dawson had clearly made a statement to those who felt he had little chance of defeating Trout. Although being knocked down twice in the same round may give the impression that a fighter was hurt, this was a tactical Boxing match and to his credit Trout was able to regroup and regained control of the fight. The primary difference in this fight was Trout’s ability to get his punches off first and outwork Dawson throughout. Trout would score his own knockdown of Dawson in round eight with a left hand and would go on to win a ten round unanimous decision. Even though he was outworked by Trout throughout much this fight, Dawson did have his moments throughout and should be given credit for the effort he put forth in this fight. Although some might be tempted to say that perhaps Dawson could have finished Trout off if he had been more aggressive after scoring those two knockdowns, it is important to remember that Trout had the quicker hands. A conundrum that can happen for fighters who are at a disadvantage in terms of hand speed is once they have hurt their opponent, if they go in for the finish recklessly there is always the possibility of being countered and caught by a punch that you may not see coming that can turn a fight around instantly. Dawson fought well in this fight and despite the loss, he proved that he was not a mere opponent for Trout. It is certainly possible that Daniel Dawson will get another opportunity against another marquee opponent in the Jr. Middleweight division. Dawson has added his name to a division that is deep with talent and should be considered a threat to anyone in the division. As for Austin Trout, this fight did get him back in the win column even though it may not have been as easy as some may have believed it would be prior to the fight. Despite suffering those two knockdowns, Trout was impressive in showing his ability to regroup and overall gave a good account of himself. As for potential future opponents, there are several fighters out there that might be possible options for both fighters. 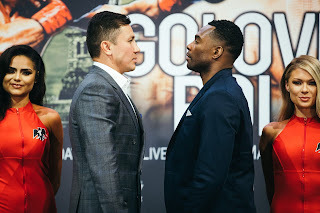 Names such as Joshua Clottey, Cornelius Brundage, Vanes Martirosyan, Jermell Charlo, Ishe Smith, and WBO champion Demetrius Andrade just to name a few each pose an interesting challenge for both fighters. In regard to Austin Trout, there is also of course the possibility that he may be able to get a rematch with either Saul Alvarez or Erislandy Lara at some point in the future. With the current unified WBC/WBA Jr. Middleweight world champion Floyd Mayweather preparing to defend his unified WBC/WBA Welterweight world championship in a rematch against former WBA champion Marcos Maidana next month, the landscape of the Jr. Middleweight division is very much open. It is quite possible that if Mayweather were to either relinquish or be stripped of his unified Jr. Middleweight championship that Austin Trout could find himself right back in the world championship picture. Although he has experienced some setbacks in recent times, Austin Trout is still very much a factor in the division. It will be interesting to see where both Austin Trout and Daniel Dawson go from here.